Feb. 14, 2011, 1 p.m.
By Martin Langeveld @MartinLangeveld Feb. 14, 2011, 1 p.m.
Facebook and Twitter may be a great way to organize revolutions, but as we saw during the last few weeks of checking #Egypt and #Jan25 hashtags, following them on Twitter can mean a frustrating hunt through lots of chaff to find a few grains of wheat. We knew exactly where the epicenter was, but we had no GPS-based way to zero in on those Twitter users who were actually on the scene. Tackable’s current shape is an iPhone app-based social network focused on geotagged news photos and captions. The system will eventually include text, audio, and video, and of course an Android app is on the way. The Tackable vision is that when breaking news happens, you’ll be able to use the app to zero in on the location on the map, and see whether network members have posted photo, video and comments, without needing to have a previous relationship with those people. In addition to enabling user-to-user sharing, Tackable will partner with news organizations to allow editors to publish its user-generated content (with an initial emphasis on photos) and to put out assignments for publication in print or online. After shopping the concept to a number of newspaper groups, Tackable chose to partner with MediaNews Group, which is providing the company with incubation office space. MNG is also paying development fees for a product specific to its 650,000-circulation Bay Area Newspaper Group (BANG), to be deployed as part of an ambitious suite of new digital tools related to user-generated content. Stangel couldn’t go into details about the MediaNews plans, but he said “It’s very different than what you would expect from a news organization. On one end, you have Murdoch’s Daily — and that’s kind of what you would expect. Here at MediaNews Group, they’re experimenting with some digital stuff that’s really out of the box, really exciting. User-generated content is our piece.” The timeline calls for deployment at the BANG papers, and others in the Bay Area, in about 60 days. Tackable already has two beta apps: one that’s customized for the Spartan Daily, the student newspaper at San Jose State University, the other a general Tackable app. It’s doing A/B testing on both, and is looking to its MNG relationship to test out its ideas for partnering with news organizations. It is currently completing the MNG version, which has some “special features” and should be finished (but not yet deployed) in about two weeks, Stangel said. After that comes the public version of Tackable. Like other location-aware social tools such as Foursquare, Tackable incorporates game mechanics to encourage user engagement. The Karma Points that users accumulate by completing assignments will be redeemable for such things as restaurant meals. 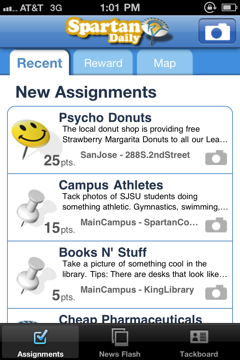 Once you sign up as a user, you can explore the assignments, listing them in terms of recency, rewards or on map. You choose an assignment, for example: “Campus Athletes: Tack photos of SJSU students doing something athletic. Gymnastics, swiming, biking. Or any sport with a ball. Good times!” This assignment is listed as earning 15 Karma points. Accept the assignment, post the picture, add a caption, and you’ve earned the points. Ultimately points can be be turned in for merchandise or services, but in the meantime, they earn you status on the leaderboard. You can follow other users; those who follow you become your “Entourage,” but via maps and keyword searches, you can see everyone’s uploaded content. You don’t necessarily have to wait for an assignment — there’s a “News Flash” page to post “unassigned field reports” of breaking news events like accidents or fires. News editors can select photos filed in response to assignments, or those posted to the News Flash page, for use in the printed newspaper or its website. In the general public version, users will also be able to send each other queries requesting photos of specific places or things, and issue their Karma points as rewards to responders. Check the pitch video (filmed at SVNewTech) for a few more details (but note that that the responses to the rights questions in the video are incomplete — see below). Ability to make photo assignments will be granted on a case-by-case basis to media partners. Stangel envisions including newspapers, television stations, hyperlocal sites, and online news organizations. Content will be searchable not only by finding it on the map, but through searches for keywords and hashtags. Stangel, 28, is a graduate of San Jose State who worked as a journalist for over seven years, first at the Palo Alto Daily News (a free paper now merged into MNG’s Peninsula Daily News network) and the Contra Costa Times, and then as a news editor at KLIV, a CNN radio affiliate in San Jose. Tackable grew out of some of his newsgathering frustrations while on the police beat in East Palo Alto. “I was writing a lot of breaking news stories, and I was doing a lot of thinking about how information was getting to me, and how long it took for information to get to me. I would wake up every morning with the feeling that something had happened overnight that I didn’t know about. So I started thinking about how I could solve this.” He began to imagine giving users the ability to click a button to indicate “news is happening here” and to have those reports show up to the editor on a map. Once the iPhone came along, he teamed up with Ed Lucero, a startup veteran who is now Tackable’s CEO, and the idea began to gel. An unresolved issue, but one that Tackable is now hashing out with its lawyers, is how to deal with content ownership rights. Stangel says, and the user agreement is clear, that users retain all rights to the content they produce and distribute on Tackable. But Tackable is working to clarify how media may use that content. “We want to do it in a way that allows newspapers and news organizations to publish all the media on this platform, for free, and without restriction, but we also want to be respectful to the people who take these photos,” Stangel said. Tackable has listened to suggestions for a payment system in which users could be compensated by news entities using the photos, but for now it is planning an open sharing model in which news organizations that partner with Tackable have free publication rights, perhaps under Creative Commons. Just how the rights language will be nuanced is still being worked out. While most Tackable content will not be top-quality photojournalism, it’s always possible that a unique and iconic photo emerges from a Tackable user who happens to be in the right spot, so Tackable is giving some thought to how to protect the user’s rights in that situation. How will Tackable make money? Stangel says that comes down the road — right now, in Phase One, Tackable’s focus is building the platform, making it robust and scalable, rolling it out nationwide, getting adoption by news organizations, building a large user base and creating communities. Revenue comes in Phase Two, and part of Stangel’s thinking there is to find ways to help move some of the billions of dollars of local advertising still controlled by traditional local media into Tackable’s digital platform. Tackable might also find revenue, or at least enhance its game mechanics, by introducing commercially-driven assignments. A very small current experiment along these lines is an assignment on the Spartan Daily app to take pictures of the Psycho Donuts shop a block from San Jose State. Complete the assignment, and you get points tradable for donuts. (As an indication of Tackable’s early-stage status, the entire scope of this deal is 30 donuts.) The idea is to evolve this concept into a premium strategy in which accumulated points can be turned in for goods or services. POSTED Feb. 14, 2011, 1 p.m.
Langeveld, Martin. "Tackable aims to become the social network for user-generated news." Nieman Journalism Lab. Nieman Foundation for Journalism at Harvard, 14 Feb. 2011. Web. 19 Apr. 2019. Langeveld, Martin. "Tackable aims to become the social network for user-generated news." Nieman Journalism Lab. Last modified February 14, 2011. Accessed April 19, 2019. https://www.niemanlab.org/2011/02/tackable-aims-to-become-the-social-network-for-user-generated-news/.